Posted November 14, 2007 at 1:35 am in indie games, indygamer, tigsource, trilby art of theft. 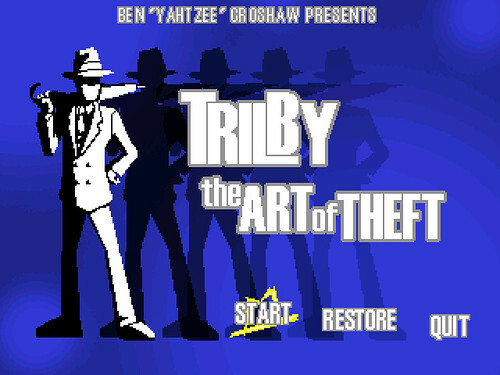 I just posted a big review of Yahtzee’s new game Trilby: The Art of Theft over at TIGSource. It basically says that it’s brilliant, that all games should be like it, etcetera, etcetera. I also posted an annoucement a few days ago at Indygamer Blogspot when I first came across it. It’s the first game I’ve come across while writing for TIGSource that I liked enough to cross post, heh. It’s really good – if you’re into indie games at all you should check it out – I’m adding it to my favourites list. I made a video to demonstrate it, since it’s hard to get the atmosphere of this one across in screenshots. That game looks pretty cool, I’ll have to give it a try. The video reminds me a lot of Elevator Action. Strange how you already have the duck and roll upgrade at level 1…. How did you accomplish that? I also have the reasonable doubt skill. Locking picking level 2 otherwise it is impossible to get a perfect on level 1. Great walkthrough though helped me out a lot on some later levels. Still have problems getting perfect scores.